An analysis of ECMO – extracorporeal membrane oxygenation – use in patients with cardiogenic shock finds that mortality remains high despite increasing utilisation of the resource-intensive intervention in this population. Season of admission (other than Fall) and presence of specific comorbidities (respiratory and genitourinary diseases) are associated with the high death rates in these patients, according to the study published in the journal BMC Emergency Medicine. "In addition to previously described associated clinical variables, the study examined different socio-economic and system level factors that might be affecting mortality in this population," study authors write. "Familiarity with patients’ characteristics and variables associated with mortality after ECMO use is important to improve outcomes further in cardiogenic shock." 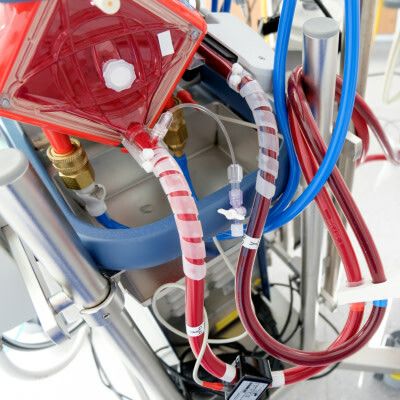 ECMO or extracorporeal life support (ECLS) is a sophisticated and resource-intensive intervention for critically ill patients with cardiac or respiratory dysfunction. ECMO use improves survival in patients with cardiac disease with survival rates ranging from 20 to 50 percent. 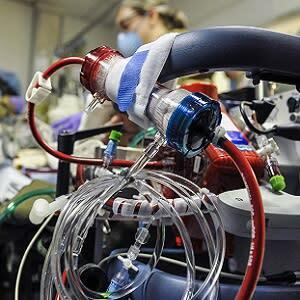 Few studies describe ECMO use in cardiogenic shock. The current study aimed to examine ECMO use and identifies variables associated with mortality in patients treated for cardiogenic shock in U.S. hospitals. Cardiogenic shock is a clinical condition of inadequate tissue perfusion due to cardiac dysfunction that is associated with persistent hypotension and end organ damage. Cardiogenic shock often results from myocardial infarction but can also result from other cardiac diseases such as myocarditis, pericarditis, and cardiomyopathy. Researchers conducted a retrospective observational study of the U.S. Nationwide Emergency Department Sample (NEDS) database of 2013. Weighted visits for cardiogenic shock (discharge diagnosis) with ECMO use were included. Collected data was analysed and variables associated with mortality were identified. A total of 922 weighted patients (mean age was 50.8 years; mostly males [66.3%]) with cardiogenic shock and ECMO were included in the analysis. Slightly over half (51.0%, n = 506) survived to hospital discharge. Mean charges per patient were $589,610.5; mean length of stay was 21.8 days. Increased mortality was associated with presence of respiratory diseases (OR = 3.83), genitourinary diseases (OR = 4.97), undergoing an echocardiogram (OR = 4.63), and presenting during seasons other than Fall. Lower mortality was noted in patients with injury and poisoning (OR = 0.47), in those who underwent certain vascular procedures (OR = 0.49) and those with increasing length of stay (OR = 0.90). "Seasonal variation in mortality among patients presenting with cardiogenic shock and undergoing ECMO procedure was also identified in this study," the authors say. "Reasons for these seasonal variations though not directly identified in our study are multiple and complex, involving both physiologic and behavioural causes. Previously identified causes include sudden cold acclimatisation, change in dietary patterns, change in physical activity, changes in mental health, vitamin D deficiency, increased air pollution, and increased incidence of infectious disease." ECMO is just one of several mechanical assist devices used in cardiogenic shock. Other devices include intra-aortic balloon pumps (IABP) and LV assist devices (LVADs). ECMO, however, is the only intervention that compensates for both the right and left heart function as well as lung function. The authors explain: "ECMO decreases requirements for catecholamine, vasodilator, and mechanical ventilation in the treatment of cardiogenic shock and reduces the complications that are usually associated with these treatment modalities. ECMO use therefore holds promise for use in selected cardiogenic shock patients and further prospective studies are recommended." High-risk ECMO - heroic rescue or futile care?